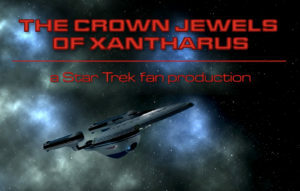 STARSHIP TRITON releases its SECOND fan film: “The Crown Jewels of Xantharus”! Another week, another new fan film from POTEMKIN PICTURES…or at least it seems that way lately! The end of August saw the release of “The Beast,” the debut episode of their new fan series Hospital Ship Marie Curie. A week later, the 14th fan film from the Starship Tristan creative group, “Deception,” was posted to YouTube. And then a week after THAT, yet another new release—this one the second fan film from the STARSHIP TRITON creative team: “The Crown Jewels of Xantharus.” Their debut episode, featuring the character of Commander Janice Rand, debuted last December. Three fan films in three weeks sounds pretty ambitious, but in fact, the goal of Potemkin Pictures, according to show-runner RANDY LANDERS, is to release an average of one new fan production per month for a total of twelve films each year. In 2016, that steak was impacted by heart bypass surgery for Randy in August, which delayed releases until March of 2017. But Potemkin came roaring back with multiple releases, two of which were released only five days apart and, at one point, five in just three months! For anyone keeping count (like me), this latest release marks Potemkin’s ninth in 2018. And since it’s September, that actually does average out to one per month…so the streak is holding! This particular episode, despite looking very low budget (as usual) was actually a really big challenge to film. It took sixteen months to complete everything (not even counting pre-production). That included separate shoots (during different months) to film scenes in a bar, on a pirate ship, on a Romulan ship, shots of Starfleet officers watching an Orion dance, the dance itself, and a Happy Birthday bit at the end. Then they had to re-film the bar scene when they had to replace one of the actors. Then they had to re-re-film the bar scene at a different location when they realized the lighting hadn’t worked! Most impressive—to me, at least—were multiple Orion women (and one man), all of which needed to be covered head-to-toe in green. I asked Randy how much make-up they went through: “Half a cake per person! But we filmed one actress who was replaced, and had to film Lezlie Cohen’s and Brute’s bar scene twice. So five and a half large cakes of Wolfe Aqua (water activated) parrot green. Total makeup time over all the shoots: 11 hours (one hour per person). Total expense in just green: $220.” Wow! It’s worth watching just to marvel at the record number of Orions in one fan film! Potemkin Pictures’ TRITON production crew releases its FIRST fan film: “New Orders”! POTEMKIN PICTURES holds a truly unique distinction in the world of Star Trek fan films. After several years of producing three dozen episodes of the fan series Project: Potemkin, the production company branched out to launch additional fan series: Starship Deimos, Starship Tristan, and Battlecruiser Kupok. 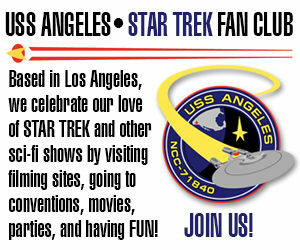 And this past July, the first episode premiered focusing on the crew of the USS Endeavour. Overseeing these various series is RANDALL LANDERS, who began shooting Project: Potemkin back in 2010 in Albany, Georgia (here’s a great interview with him) and then moved to Pelham, Alabama, where he currently lives. Randy serves as executive producer and edits just about all of the episodes. He also directs some of the episodes, provides the occasional story and/or script, sound effects, and even makes the rare appearance in front of the camera. Randy and his team are a fan film-making MACHINE! For years, there was something new released from Potemkin Pictures at least once every month or two! But things have slowed down recently. Their last offering, an episode of the Klingon-based series Battlecruiser Kupok, was released at the end of August. In the three and a half months since, we’ve seen nothing from any of the Potemkin series. Then, late last week, there was a fan film release from a brand new Potemkin Pictures production crew: TRITON. With the fan film guidelines now nixing ongoing fan series, this new offering is not called Starship Triton but rather is simply credited to the “Triton Production Crew.” But one would assume that, like the other series, it will focus on the missions and crew of a single starship. While most Trek fan films are set in TOS, TNG, or NX-01 periods, all of the Potemkin Pictures series (I mean “production crew projects”) are set in a time after Star Trek VI and before TNG. This latest production focuses on Commander Janice Rand, recently reassigned from the USS Excelsior where she served with Captain Sulu. Somewhat unavoidably—considering where the new series is filmed (Alabama)—Rand has developed a distinctive southern drawl. But if you can get past that, this looks like a promising new fan series…even if we can’t call it a fan series. You can access the entire nearly FIVE DOZEN fan films released thus far by Potemkin Pictures at their website. Author Jonathan LanePosted on December 20, 2017 December 22, 2017 Categories Fan Film Features, NewsTags Potemkin Pictures, Randy Landers, Starship Triton1 Comment on Potemkin Pictures’ TRITON production crew releases its FIRST fan film: “New Orders”!